Spray 2-quart casserole with cooking spray. 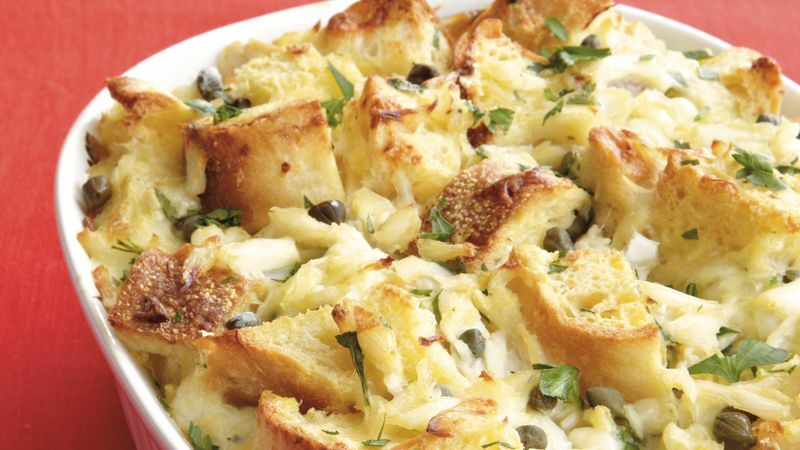 In large bowl, mix bread cubes, crabmeat, cheese, capers, 1/4 cup parsley and the garlic. In medium bowl, beat eggs with wire whisk. Beat in half-and-half and lemon juice; pour over bread mixture. Spoon into casserole. Cover tightly; refrigerate at least 2 hours but no longer than 24 hours. Heat oven to 350°F. Uncover casserole. Bake 45 minutes or until knife inserted in center comes out clean. Let stand 10 minutes before serving. Sprinkle with additional parsley. For convenience, this casserole can be refrigerated overnight. After baking, serve it with a salad of seasonal fresh fruit.